It is imperative that we hold these student leaders accountable, especially given that these tours are giving student government representatives a skewed if not incomplete view of the conflict. These reports also raise ethical questions about student senators who benefit from funded trips and then may be asked to vote on questions about university funds tied to Israel’s occupation policies. Click here to read more of Rebecca’s powerful piece at Mondoweiss.net, and for more info on the ADL trip as well, click here. Click the image below to see the full sized version of Blue Star PR’s email to supporters on May 22, 2013. I was shocked by your decision last month to adopt a resolution supporting divestment from U.S. companies accused to profit from the Israeli occupation of the West Bank, but then I learned with great satisfaction that you had decided to rescind your decision, thus creating a more open space, free of intolerance and hostility on your campus. You are to be commended for recognizing that your first decision was erroneous, and more importantly for taking the right corrective action by rescinding it. It is a sign of wisdom and maturity to re-examine a decision once more facts are made known. 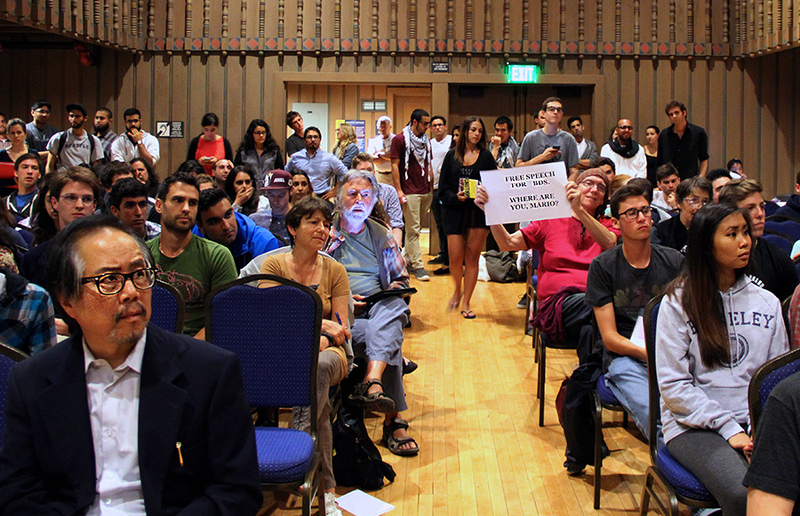 The supporters of divestment present a distorted image of the reality Israel is facing. The “oppression” the Palestinians complain about incessantly is due entirely to their rejection of every peace offer Israel has made over the years, and to their refusal to meet with Israeli officials to negotiate the terms of a final peace agreement between the two peoples. They could have had their own state and live in peace side by side with Israel in 1948, 2000 and 2008, and could still do so at any time today. But instead they chose war and terrorism in a vain attempt to win it all and have to make no concessions. When they decide to make peace, the occupation will end, and with it the perceived need to hold hostage millions of students on American and Canadians campuses for a cause that few are really interested in. 50 years ago Martin Luther King Jr. sent his “Letter from a Birmingham Jail” to address the commonly repeated notion that the south was not yet ready for civil rights. He responded by quoting Chief Justice Earl Warren by saying “justice too long delayed is justice denied.” I urge you to stand on the right side of history, right now, in the name of freedom, justice, and equality for all people, it being understood that “all people” means Israelis and Palestinians alike, not just the Palestinians alone. Adopting a resolution calling for divestment was the wrong thing to do last month, and it remains the wrong thing to do today. Thank you for your courage and integrity. I know that tonight’s debate on divestment will be emotional. Both sides will be passionate. But I as a responsible representative of the student body—and the University at large—I hope you’ll base your decision on FACTS. It’s for this reason that I attach a one-page fact sheet (pdf) on the BDS issue. I hope you’ll take a minute to read these indisputable facts. If you do, I believe you’ll conclude that the BDS movement does NOT support the aspirations of the Palestinian people for self-determination . . . and that this movement is led by people who fundamentally OPPOSE the right of the Jewish people to have a state in Israel. But the facts speak for themselves. Please review before voting tonight. And thank you for your commitment to truth and justice. I am a third year student at the University and I was deeply appalled by the divestment from Israel Resolution. I feel that it was wrong because it marginalize me. The divestment allows for the singling out of not only Israeli and Jewish organizations on campus, but also of Israeli and Jewish students, it is unacceptable for a University of UCR’s caliber to be prejudice against a group. It is also depressing because as the Senators I voted for I expected a less discriminating and more accepting decision. I don’t feel accepted on this campus and I keep wondering who supports this resolution and who is against it. Who welcomes me and who thinks my country commits acts of genocide I also want to say you have taken a side by passing this resolution. You, ASUCR, are no longer neutral in this conflict. You have stated that ASUCR believes that Israel is partaking in Apartheid. This is a huge accusation. You also have stated in your resolution a number of war crimes and injustices that have not been proven by facts or have happened. Does the Senate speak for me because I disagree. To compare Israel to South African Apartheid is absolutely offensive. I hope the Senate realizes they have made a statement to California, to American and to a whole Country. That no other Country has made that no other governing body has made. This is in regards to the divestment vote that just passed, I am extremely upset that a vote on a matter such as this was done in almost complete secrecy. The student population had a right to know when this vote was occurring and should have been given the right to protest this, in fact there was no effort on the part of ASUCR to let the student population know about this vote. I hope that you will veto this passed vote, if not there will be protests and formal letters of complaints mailed to all UCR officials, and media outlets about the injustice that has occurred on our campus. Today I write to you as a Highlander Alumni, as a Highlander alumni who is ashamed to be a Highlander Alumni. It has come across my attention that the ASUCR Senate has passed a resolution to divest from Israel. This means that ASUCR has come to resolution that UCR should not do business with any companies in which are associated with Israel. First, I want to thank the senators who voted against this resolution. As an alumni, and as a former ASUCR Senator myself, I am disgusted that the ASUCR Senate would pass a resolution filled with fallacy and out right lies. This document is full of fallacy, lies, and deceit about Israel and the Jewish people as a whole. As a Jew, I feel singles out by such a resolution, in which is passed by my alma mater. In addition to inspiring hatred of Israel, its people, and of Jews, this document is filled with historical inaccuracies and defamation. There is no academic value and no integrity to such a resolution being passed by ASUCR or an AS Senate anywhere in the UC System. The mission of the UC is to teach, to research and to do public service. The goal of a University such as ours is to promote the exchange of free ideas and knowledge. This resolution does NOT do that, it actually promote hatred and dishonesty. This deceitful resolution does not accomplish any of the University’s missions or goals. Mr. President, Madame Chancellor, and distinguished Senators, I know I speak for myself, other alumni and current students of both UCR and of UC when I say that this has NO place at our University. Therefore, Mr. President, Madame Chancellor, and Senators, I URGE you to repeal this resolution and to strike it from any official record. J Street strongly opposes the views and positions such as those captured at the Palestinian BDS National Committee’s website, www.bdsmovement.net. As laid out in that site, the BDS movement fails to explicitly to recognize Israel’s right to exist and it ignores or rejects Israel’s role as a national home for the Jewish people. In addition, the promotion by some in the BDS movement of the return to Israel of Palestinian refugees from 1948 and their families indicates support for an outcome incompatible with a two-state solution to the conflict. J Street recognizes the legitimate and urgent concerns related to peace, justice and human rights that have motivated calls on college campuses and beyond to boycott certain Israeli products or divest from U.S. companies that support continuing Israeli policies of occupation and settlement expansion, or for governments to impose sanctions on Israel. We recognize that the sluggish pace of diplomatic progress toward a two-state solution motivates some of these efforts. However, the urgent need for peace will not be reached through alienation. J Street believes that a peace resolution will be reached through international, and more specifically regional, cooperation. Long-term progress will be achieved through diplomatic means, not isolation. We oppose the occupation of the West Bank and the expansion and entrenchment of settlements there. We also oppose encroachment on Palestinian areas of East Jerusalem, which must be part of a future Palestinian capital if a two-state outcome is to be achieved. J Street believes, however, that these legitimate concerns are best addressed through urgent pursuit and implementation of a two-state resolution to the conflict. A two-state resolution is, in our view, the only way for Israel to guarantee long-term international recognition and security. For these reasons, J Street urges that you vote against the BDS resolution under consideration.